Now that the summer is over, I'm knee deep in a number of different projects. It feels great to be making progress on the layout again. First up is the roundhouse at North Pierce. Little has been done in this area since I built the diesel fuel tank back in March of 2012. It appeared in an article in MRH and here's a link to it: http://issuu.com/mr-hobbyist/docs/mrh12-05-may2012-ol?viewMode=presentation&mode=embed. Over the last month or so, I've toyed with the idea of replacing the roundhouse with a two stall board and batten engine house similar to the one at Cane Fork Yard on the C&O. The existing turntable is too short to turn a set of 4-axle diesels coupled together, so to get two locomotives into a single stall, they would have to be removed from a consist. This just isn't something that's going to happen during a operating session so the two stall engine house seemed to be a good solution. However, after reviewing the plans of the Cane Fork facility that Bill Ford sent me, it became apparent that it was just too big. Even a scaled down version would have required a new turnout and the removal of the turntable. But then it struck me- the radial track aligned with the track leading to the turntable is long enough for two 4-axle diesels. And the turntable and lead track could hold another two 4-axle units. So the turntable and roundhouse stay and I've now started working on the radial tracks and roundhouse. The photo below shows progress so far. After playing around with the concrete color for the base of the roundhouse, it finally occurred to me that nothing inside the building will ever be seen by anyone. All of the neat little touches that I had planned, like painting the interior walls as though they had been whitewashed and painting the lower portion of the roof support beams in safety yellow, would be a big waste of time. I have no interest in making a removable roof so none of this stuff would be visible. I'll spend some extra time making sure the exterior looks good, but for now I plan to skip the interior detail. In addition to the Kadee covered hopper car that I weathered in a previous post, I also painted and letter an Atlas covered hopper for the home road. This is another one of the kits I picked up used at Tim's Trains and Hobbies in Covington, KY. The detail on this car is really impressive. I used the same techniques on this car that I used on the Kadee car but I went a little bit lighter on the overall weathering. Along with the two covered hopper cars, I also painted and lettered two tank cars. The UTLX car will be in diesel fuel service in much the same fashion as a large number of similar UTLX cars on the L&N. These two cars are now in the paint shop awaiting weathering. 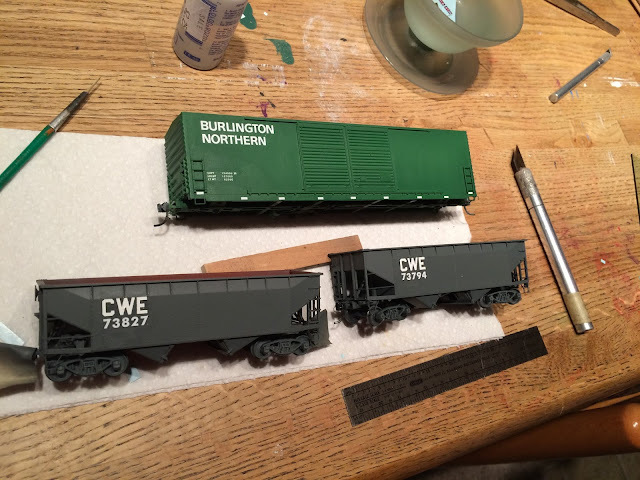 In addition to the two tank cars, I've been kit-bashing a couple of Gunderson double door boxcars as outlined in Bob Rivard's article in the July 2014 edition of MRH. Here's a link to the article: http://mrhpub.com/2014-07-jul/land/#94. The side ladders w were removed and new ones made from Details Associated ladders. The doors on the SP&S car were cut off and new ones were scratch-built. This seemed easier than trying to remove the tack boards that were on the Superior doors I had in the scrap box. The photo below shows the BN car in the decal shop along with a couple more coal cars. The next photo shows the progress on the SP&S car. I'm waiting for the door hardware to arrive and the cut levers still have to be added. It's been a long time since I kit-bashed a car like this and it has been a blast. I'd forgotten how much fun and how rewarding projects like this can be. And last up, I'm finally getting around to finishing the caboose service tracks at North Pierce. The shot below shows what I believe will be the final placement of the old coal storage shed, the trailer and the fuel oil tank. Other details such as line poles, lights, ladders, etc. are currently under construction. I plan to finish the scenery in this area of the yard as well. And the last shot shows the coal shed after its trip through the paint shop this morning. It was scratch-built according to standard C&O plans. I had one here previously but it ended up next to BA Cabin at the west end of the yard at Nelsonville. As long as the Evergreen board and batten siding is out, I may as well build the tool shed that will be located at Nelsonville. But that's a topic for another post. The scenery around the west end of Nelsonville is finally complete. Well, almost. There's still a little work to be done around the pulpwood unloading area, but for the most part, the scenery work here is finished. In the photo below, you can see the signals that are now controlling the west end of Nelsonville Yard. Signal are now operational from here to Petersburg Junction west of Big Chimney. In the next photo, we see the Summit Springs Shifter as it begins the climb up the two percent grade to Summit Springs. Last up, we catch a glimpse of the cab on the back end of COXL 351 as it heads up the hill toward Summit Springs. 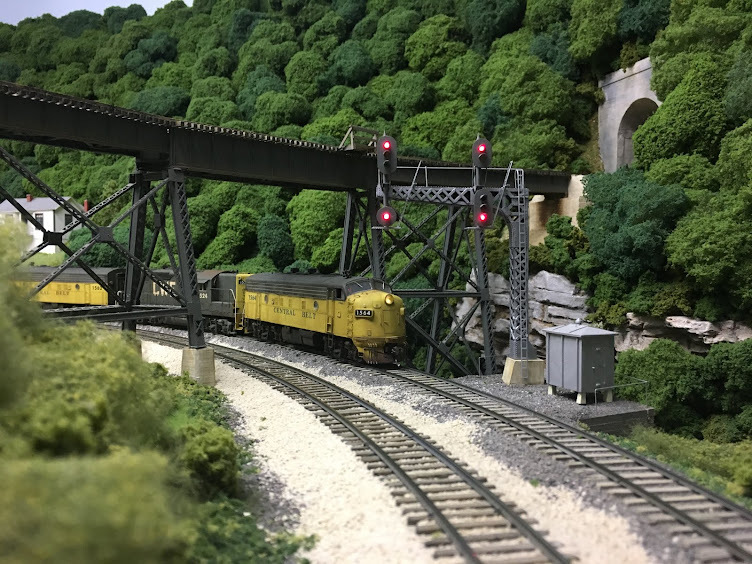 If you take a look at the free layout tour of the Chesapeake, Wheeling & Erie on TrainMasters.TV (http://trainmasters.tv/videos/tmtv-2013-11-act-iib), you can see all of the structures and scenery that has been added since the video was shot. It's fun sometimes to look back and see what progress has been made.